To Pot a Hare Take a Hare that has hung 4 or 5 days, [case?] it and cut it in quarters put it in a pot, season it with pepper, salt and Mace, and 1 lb of butter over it and bake it 4 hours. When it comes out of the oven pick it from the bones, and pound it in a Mortar, with the butter that comes off your gravy, and a little beaten cloves and mace till it is fine and smooth, then put it in close pots, and put clarified butter over it. Tie it down with white paper, and keep it in a cold place. 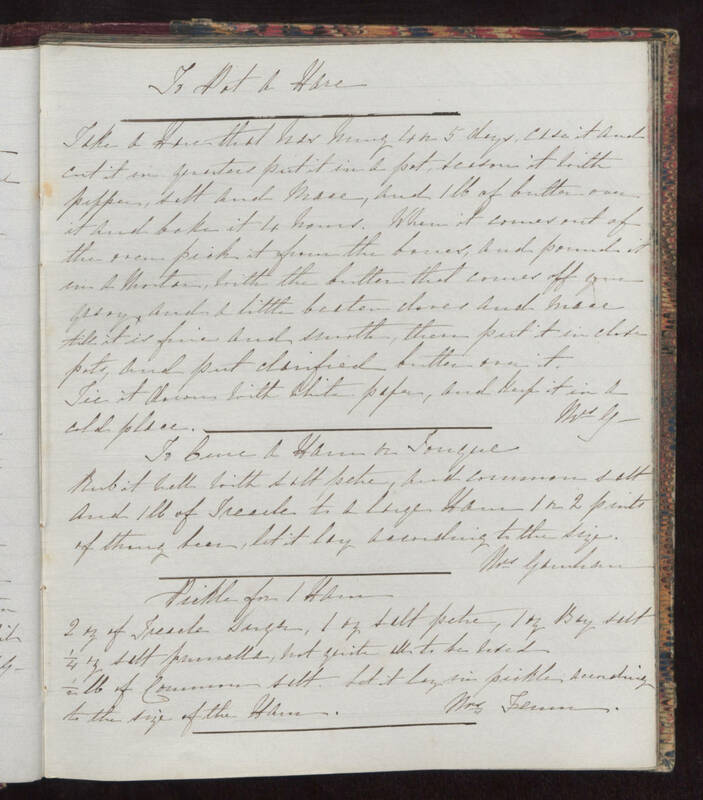 Mrs G- To Cure a Ham or Tongue Rub it well with salt petre, and common salt and 1 lb of Treacle to a large Ham 1 or 2 pints of strong beer, let it lay according to the size. Mrs Gamhan Pickle for 1 Ham 2 oz of Treacle Sugar, 1 oz salt petre, 1 oz Bay salt 1/4 oz salt prunella, not quite all to be used 1/2 lb of Common salt. Let it lat in pickle according to the size of the Ham. Mrs Fenn.